University of Oxford researchers are developing a method for the homogeneous conversion of CO2 to methanol, with methanol as the only resulting C1 product. With momentum building in the methanol powered fuel cell market there is good reason to be on the lookout for the lowest cost and highest efficiency paths for producing methanol. Andrew E. Ashley, Amber L. Thompson, and Dermot O’Hare at Oxford use a “frustrated Lewis Pair” (FLP)-based nonmetal-mediated procedure at only pressures of 1–2 atmospheres and 160 °C. There’s a head turner – very low pressure, and not particularly hot. The construction cost of such a plant and the energy used if the research makes it to commercialization would be much less than those using higher pressures and temperatures. 160 °C equates to only 320 °F and a 1-2 atmospheres is only 14.7 to 29.4 psi. This team is on to something; such operating conditions are very attractive. FLP Methanol Process Diagram. Click Image for more info. A frustrated Lewis pair (FLP) is a Lewis acid – base pair in which steric hindrance precludes the formation of a regular Lewis acid-base adduct. The steric hindrance occurs when the size of groups within a molecule prevent chemical reactions that would occur in related smaller molecules. Thus the “frustrated” effect. The Lewis acid-base adduct is a molecule formed by the direct addition of two or more distinct molecules causing a frustrated formation—as in ammonia borane. Kept from the “normal” reaction, these “frustrated” groups so turn to other molecules for reactions. That’s the opportunity the team has exploited. 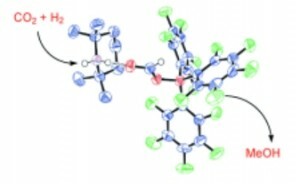 As you’ll note if checking the (FLP) link that other research groups have shown that FLPs can activate H2 heterolytically, the cleaving a chemical bond effect. At first glance the hydrogenation of CO2 to the methanol molecule CH3OH might seem simple, but getting rid of the excess O and coming up with and attaching three H just right is a not so simple task. Current approaches to hydrogenation rely on solid oxide catalysts and are not exclusive to methanol output. The team is currently focusing investigation on increasing the stability of the system towards hydroxylic agents with the hope of thereby rendering the system catalytic. What’s left out is what to do with the by-products and a needed recycling system. The increasing efficiency from 17 to 25% yield is an opportunity as well. The possibilities are intriguing; these are mild conditions that can be created from concentrated solar and other low temperature sources and work below water faucet pressure. It might put a private “methanol economy” within reach if sources of hydrogen can be economically found to work at personal levels – and that’s the problem searching for low cost solutions. Liquid fuel, a concentration of stored energy in the form of methanol is a very high potential path to personal energy storage. As methanol fuel cells improve and come down in price there’s going to be a market contest in fuels. One consumers can look forward to. Interesting mechanism, must majorly tweak yield. thanks for your hard reseach and working on your project and is it possible to use this idea in car industies?